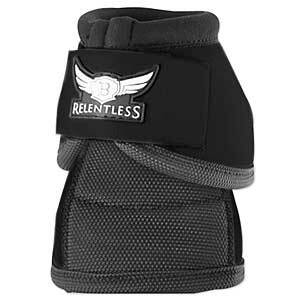 The new Relentless Strikeforce Bell Boot takes overreach protection to the next level! 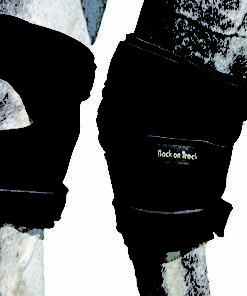 It combines new technology to protect the sensitive bulbs of the horse’s heels with savvy design for a top quality, long-lasting boot. 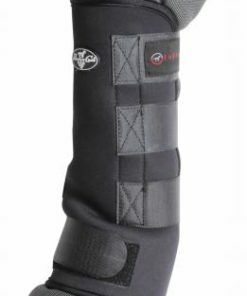 This rugged bell boot is made of 2520 denier ballistic nylon to ensure a boot that can withstand the pressures of everyday riding and rigorous competitions. 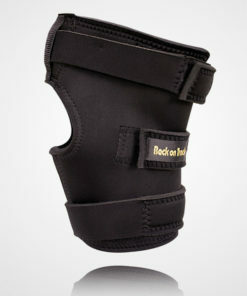 The double layer foam with Kevlar provides maximum absorption and deflects impact while the taller cuff design improves the total protected area. Your horse will be protected in the event of crossover thanks to the additional foam layer on the interior sidewall. 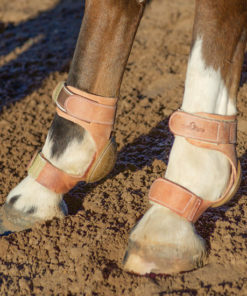 Angled hook and loop closures that follow the contour of the boot allow your horse to move naturally without impedance from the boot. The interior heel bulb makes for a boot that goes in place, and stays in place during aggressive maneuvers and high speed riding. The reinforced bottom binding reduces rebound providing a no-turn, locked-in-place boot even when your riding in deep footing. Many color choices available.